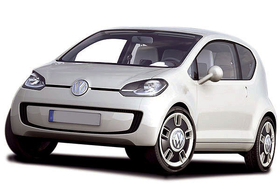 DETROIT -- Volkswagen could unveil a shorter variant of its Up minicar concept at the Geneva auto show. Wait for the next motor show and you may see a small derivative of the Up, Ulrich Hackenberg, VW board member responsible for development, said. On such a smaller derivative model of the Up, a three-seat configuration is possible, Hackenberg said. The model could compete with Toyotas iO minicar. The Up was first displayed at the 2007 IAA in Frankfurt.